While the world is inclined to look to China to possibly lift the global economy out of the present recession, underneath its impressive US$ 2.0 trillion foreign exchange reserves and recently announced 8.7% GDP growth in the year of 2009, China is, in fact, challenged by increasing social and economic uncertainties and threats. Overtaking Japan and likely being the second-largest economy, the socio-economic stability and sustainability of the country has an unprecedented influence on the order and peace of the globe. Despite the 8.7% GDP growth was stronger than many other countries could have achieved in 2009, it was the slowest since 2001 in the light of the Chinese economy. It is suspected that about 80% of the 8.7% growth was attributed by the RMB 4 trillion stimulus package and if this is really the case, it only reflects that the massive domestic economy of China has not yet had the capacity of being resilient to the financial and economic crisis without the stimulus rendered by the government. Those who believed that China had already grown out of its reliance on its Western counterparts might likely be disappointed by the reality that the country was still very much dependent on exports and foreign investments. The collapse in exports and the slowdown of foreign investment have, in turn, caused consequent job losses throughout the country. Underlying the 8.7% economic growth was the total amount of new bank loans extended in 2009, which was equivalent to RMB 9.6 trillion versus RMB 4.2 trillion in 2008. Alongside this huge amount of lending were massive infrastructure projects and an upsurge of property prices throughout the major cities of the country whereas the Shanghai Stock Exchange had the third-largest stocks trading turnover in 2009. However, the urban registered unemployment situation was 4.3% comparing to 4.2% a year ago. The unemployment situation of other categories of labour force, including the urban unregistered workforce, migrant workforce and surplus rural work force remain unknown. Nevertheless, from the fact that the farmers refused to buy the government subsidized electrical appliances since they would not be able to afford the utility costs, it is reasonable to guess that the rural unemployment situation has not been improved. While the subprime led recession has undoubtedly exposed the underlying social and economic problems of China, it has also raised the concerns about the sustainability of the country. Learning from the subprime financial crisis, as pointed out by Bernard Lietaer, the financial system establishes the foundation of sustainability of all other socio-economic subsystems. Therefore, the stability of the Chinese financial system, to a large extent, becomes the core consideration for the future of both the country and its trade partners. However, the present Chinese financial structure is very much operated and evaluated by mathematically-driven and politically-dominated orientation. The integration and connection between finance and the Chinese cultural roots are very much missing from the scene. Sadly, a socio-economic foundation which is not embedded in the cultural roots is tended to be fragile and unsustainable. From my first visit to Beijing back in 1983 to the past seven years which I have been spending my life in China, I witness an alarmingly growing disconnection of the Chinese people from their original traditions and cultures. It is, in fact, very sad and worrying to see the younger generations, which are to a large extent dominated by materialism and compulsive greed. The loss of identity and values has led to emptiness and purposelessness. The meaning of life is, indeed, occupied by the pursuit of money and self-pleasure. As an entrepreneur and ex-investment banker, I fully understand and see the risk of short-termism, particularly when it has become a dominant trait of the present Chinese society at large. Short-termism is one of the most damaging causes of financial instability. While this book addresses the concern of the socio-economic reality of today’s China and, on the other hand, it also draws an awareness of the disconnection of the country’s present phenomena from the original Chinese thinking with regard to the cosmic rhythm. A disconnection or disintegration between cultural traditions and reality may very likely lead to unsustainable development. The implicit traditional Chinese belief in that behind the cosmic correspondence where everything is interconnected in this cosmic world, which has a cosmic rhythm shared by all. However, if any one of the cosmological elements is missing or in disorder, the overall cosmic rhythm will be interrupted and chaos will then result. Given the fundamental role of finance within the entire socio-economic paradigm and taking into consideration the cruciality of the harmonious interconnection of the cosmological elements, the interdependent philosophy of the Five Elements, from the perspective of the Chinese spirituality provides an irreplaceable metaphor in the study and operation of financial systems. From the Chinese perspective, while the Yin-Yang school promulgates the irreplaceable importance of the nature of balance, the theory of Five Elements, is an interconnected and intersubjective universal principle and discipline in respect of harmonious development of the socio-economic system. However, since finance has been used largely as a tool of profit accumulation and as a result, the growth and development of other socio-economic subsystems have been vastly scarified. 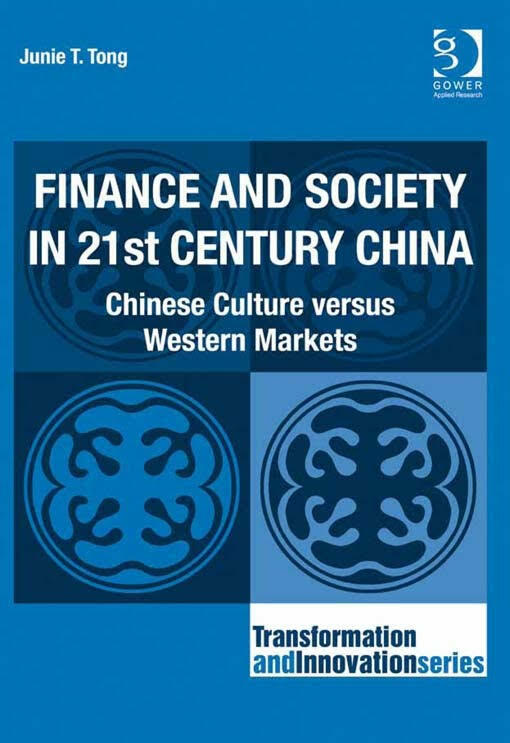 This book aims to provide an overall picture and derive better understanding of the critical issues of banking and finance from both a global and local Chinese perspectives. On the one hand, it is hoped to raise the awareness of the severe social and economic disruptions which finance has caused from a global perspective. On the other hand, it is aimed to raise the consciousness of the threats and challenges resulting from the disconnection and disengagement from the Chinese cultural roots with regard to the application of finance in China at the present age. hurdles which remain to be overcome. In other words, it is awfully important for Shanghai to become a financial centre that brings about financial stability and socio-economic sustainability. 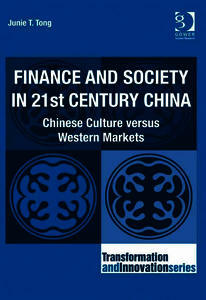 This book, in fact, offers a new kind of financial knowledge to the present Chinese society. This book illustrates how the theory and practice of the Finance-in-Society Model in the Chinese context are established, developed and operated. The Chinese-contextualized Finance-in-Society Model is a financial innovation for China in the early 21st Century while it is aimed to effect a financial transformation which leads to trust and sustainability.